The EVO Serie of HAOJIN, which combines several innovative technologies and is rich of racing sports genes, is the quintessence character since the last 20 years. It allows people to try their wild driving pleasure. The EVO Serie has been launched in the market for 4 years and has received numerous praises. In this period, it has also received the unanimous approval recognized by consumers. Today, HAOJIN launch a new upgrade model of this serie Evolution-EVOⅡ. EVOⅡbases on the old model and makes a lot of upgrade and improvement. How is the performance of EVOⅡ? This time, we invite the most professional test driver WHO named LIU to test the appearance, the power, as well as the maipulation system of this new upgrade EVOⅡin the angle of the nomal consumers. The blue motorcycle body of EVOⅡ, decorate with the fashion decals, display but not flatulent. 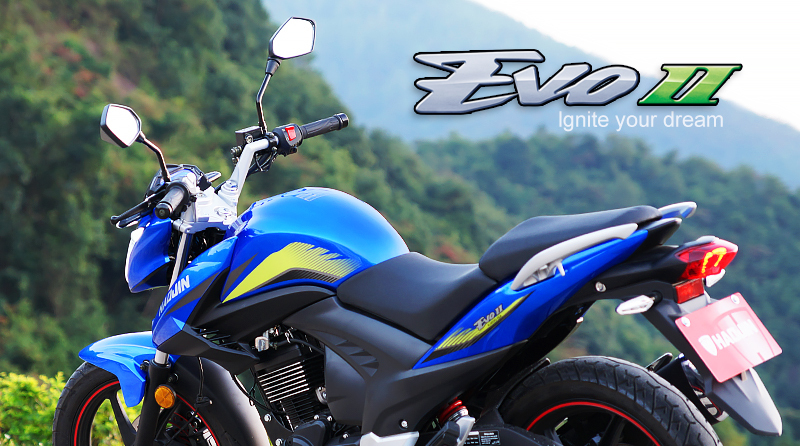 To have a look, the motorcycle body of EVOⅡ is compact and stable, the line is hale and powerful. The head of the forward dive, the split handle, the matte black engine and the large diameter exhaust pipe go well with each other, which is a good way to create the visual effect of the large displacement sports street motorcycle. The sharp LED headlight style, and it is full of liquid crystal meters, and the displayed information is still clear under the outdoor glare. It is worth mentioning that the inside of the left mailbox guard has a USB charging interface, which can charge mobile devices such as mobile phone conveniently. Although the appearance is not the most important aspect for consumers when choosing a motorcycle, the comparison of motorcycles of the same type but different brand, the cool shape can play an icing on the cake, especially the street sports motorcycle. I think this EVOⅡ has already grasped this advantage. This EVOⅡ is equipped with a CBF engine with a displacement of 200cc with a maximum output of 10 KW. The maximum torque 14N.m. The crankshaft eccentric design greatly improves the energy efficiency of the energy. In order to effectively balance the vibration of the engine, we use the built-in balance shaft design to make sure that the engine runs more smoothly. The engine’s power performance, high combustion efficiency and comfort are much better than the average 200cc engine. I rode the EVOⅡ on a country road and then transferred to a mountain road through the high-speed provincial road to experience all aspects of the performance of EVOⅡ under different road conditions. In the entire ride, the engine vibration is barely felt at the low and the medium speeds. What surprised me a lot during the ride was the engine seemed to have an endless torque protection, no matter EVOⅡ was overtaking or going uphill, and it could easily exceed 100km/h. The low-speed torque output of EVOⅡ is indeed commendable. This has the advantage that the rider does not have to shift frequently during acceleration or deceleration in urban areas or corners. In addition, a good low speed torque output makes a better acceleration condition of the motorcycle. When I was riding EVOⅡ, I could surpass the car that was going uphill easily . In a word, I am so satisfied with the power of the EVOⅡ. The dynamic of the EVOⅡ is accord with the positioning of this motorcycle, which is with good acceleration and high speed. The EVOⅡ is equipped with a central deceleration system. This structure can efficiently decompose the vibration of the motorcycle body and increase the turning balance and manipulation. The EVOⅡ is also equipped with front 80/100-17 and the rear 110/80-17 racing tires. The grip, the manipulation and the safety are so good during cornering that I can safety bend at high speed. At the same time, the front and rear double disc brake force output of the EVOⅡ is very linear, and it is different from the braking force of the low-end disc brake, so the brake of the EVOⅡ is easy to operate. The acceleration , braking, steering and other aspects of operational sensitivity are just right, the overall performance is balanced. When passing a corner, it can smoothly pass through the undulating road surface, the direction is clear, and the road feeling is also clear. I rode the last version of EVO, it left a good impression on me, I tried to ride the upgraded version today, it still brought me a lot of surprise. I was very happy with this test ride when the long diatance test ride of the day was over. Like my partner, EVO Ⅱ is just stable and reliable.